“At Benchwarmers in Raleigh, NC, they take their bagels seriously. They use fresh-milled Red Turkey wheat and Einkorn. The dough goes through a three-day fermentation process. They bake everything in a 10,000-pound, ripping hot wood-fired oven. And then they stuff their No. 5 bagel sandwich with Lay’s Kettle Cooked potato chips. Because, thankfully, they don’t take themselves too seriously. The sandwich has a creamy smoked fish spread (done in-house, in that same wood-fired oven), trout roe, house-made pickles, and a handful of Lay’s chips. 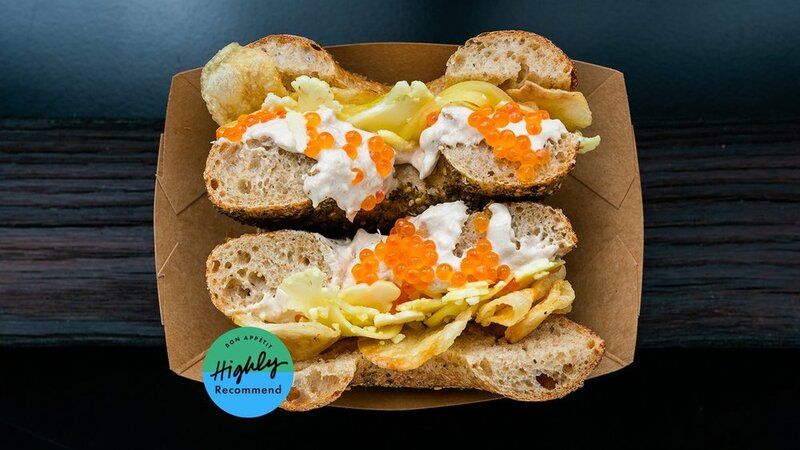 The result is a study in the number of different textures you can physically fit between two pieces of chewy bagel: There’s the creaminess of the fish spread, the crunch of the chip, the pop of the roe, plus the snap from the pickle. Together, it’s chef’s kiss. Read the entire Bon Appétit article here.